This animation combines the TEMPEST-D (Temporal Experiment for Storms and Tropical Systems Demonstration) data with a visual image of the storm from NOAA's GOES (Geoweather Operational Environmental Satellite) weather satellite. The brightly colored image taken by the small, experimental satellite TEMPEST-D (Temporal Experiment for Storms and Tropical Systems Demonstration) captures Hurricane Florence over the Atlantic Ocean on Sept. 11, 2018. A miniaturized microwave radiometer onboard TEMPEST-D reveals the eye of the storm surrounded by towering, intense rain bands. The green areas highlight the extent of the rain being produced by the storm, with the most intense rain shown in the yellow and red areas. 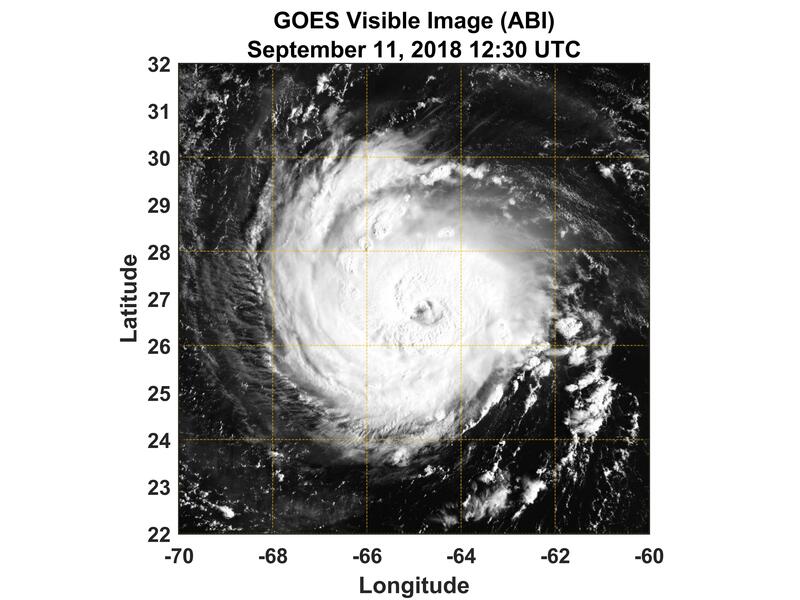 The TEMPEST-D data is contrasted with a visible image of Florence taken by the GOES weather satellite, which shows the familiar cyclone-shaped clouds of the storm, but doesn't reveal what's inside. 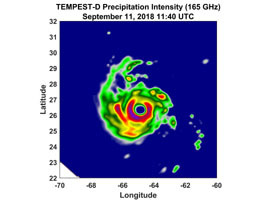 TEMPEST-D is a technology demonstration mission led by Colorado State University and managed by NASA's Jet Propulsion Laboratory (JPL) in Pasadena, California, in partnership with Blue Canyon Technologies and NASA's Near Earth Network ground station operated by Wallops Flight Facility. The mission is sponsored by the NASA's Earth Ventures program and managed by the Earth Science Technology Office (ESTO). The radiometer instrument was built by JPL and employs high-frequency microwave amplifier technology developed by Northrop Grumman Corp.
For more information about TEMPEST-D visit https://www.jpl.nasa.gov/cubesat/missions/tempest-d.php.